10 years ago,as a computer user,my hard disk capacity volume is only 40GB,the operating system then was just Windows 98.You know what?The mostly operations on computer was not study,not work or play games,but re-install the Windows 98 again and again.Because of the computer virus ,unstable Windows 98 with so many system bugs.The computer always turned to a blue screen,or crashed suddenly without backup. Nowadays,most of us have the big capacity hard disk to store our favorite docs,video,audio,photos or other useful data.And the windows system has already upgraded to windows 10,mostly important,the operating system is stable enough for us to enjoy the digital life.But we still have data loss during our daily life.The reasons are accidental deletion,or formatted partition accidentally,etc. No matter system crashed,computer virus,accidental deletion,formatting or some other data loss situation,we have Bitwar Data Recovery- best free data recovery software which can help you to recover lost data quickly and safely. Compare with some many other rival data recovery software which claimed they can recover all lost data.I am strongly recommend Bitwar Data Recovery software ,which is really a best free data recovery software I ever seen.More than this,the software is free!You can recover data no matter from deletion,formatting,lost partition or even can recover data from a inaccessible Memory Card,portable hard disk,etc. Why Bitwar Data Recovery is the best free data recovery software? 1,Bitwar has 4 software to meet our data recovery requirements in different platform, such as Data Recovery for Windows,Data Recovery for Mac,iPhone Recovery, Android Recovery. 2,All of the file types like audios, photos, videos, docs, compressed files are supported to recover easily and safely. 3,Humanized Balloon Toottips in the first launch of Bitwar Data Recovery software,which leads you step by step to use the software. 4,Multilanguage supported in the software which allows people to use in different country,such as English,French,Russian,German,Spanish,Portuguese,Korean,Japanese,etc. 5,Friendly user experience of the software with a clearly step by step operation interface. 6,Support deleted/formatted recovery,raw recovery,partition lost recovery,inaccessible memory card recovery,etc. 7,Two friendly operation mode,standard mode and wizard mode gives a permission for users to use the software easily and cozily. 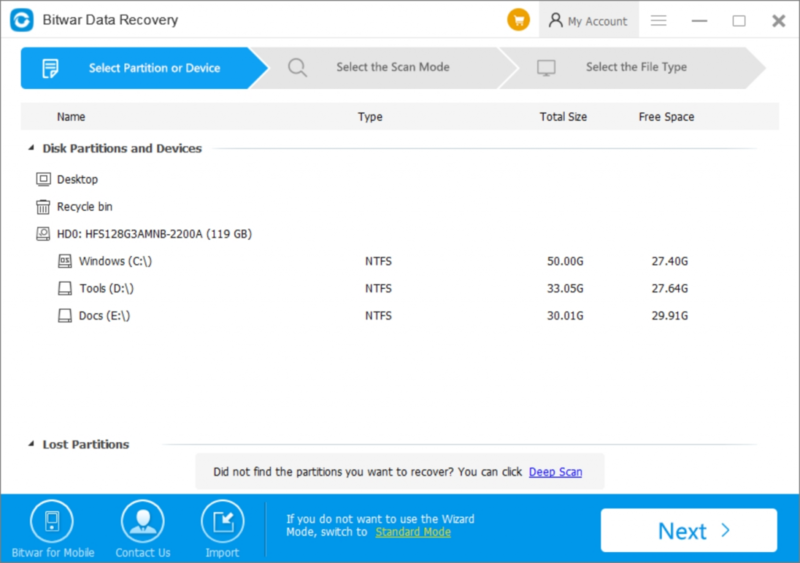 8,Three scan modes:Quick Scan,Deep Scan and Formatted Recovery,you can choose Quick scan to find your lost data quickly. 9,Powerful file filter functions such as “Search by file name”,”Filter by type”,”Filter by path”,”Filter by time”. 10,Convenient preview function,double-click the file,single-click the magnifier button or turn to Preview Tab to list the files with thumbnail icons. 11,Strongest Media Preview function,the software embeds with a inside player which allows us to play the video,audio even GIF images in the preview window.None of other software now support in this way. 12,Portable devices are also well supported,no matter USB hard disk,SD card,CF card,SSD,digital camera,notebook or other common seen portable devices. 13,The software is compatible with all windows operating system and latest Mac OS,iOS or android OS. 14,Supports to import or export the scanning results for later use. 15,VIP version allows you to recover data with unlimited amount of data.Before you decide to pay the software,you can have a chance to use the software with 30 days free trial. 16,Only few steps to recover lost data without tech skills. 17,Free to pause or stop the scanning process. 18,Fast response online support with 7X24 hours service.